In our last couple of posts, we saw the basics of saltpeter extraction and also an insight into the bacterial and chemical processes involved. As we saw previously, it was the job of saltpeter men to go around the country and locate soils rich in nitrates, so that saltpeter could be extracted from them. They often found these lands close to places where organic materials decomposed, which were sheltered from rain and sun. This usually meant digging in cellars and stables of various farms. However, the formation of saltpeter in these areas was a slow process and the supplies could not keep up with the demand. Therefore, people began to prepare special areas to produce saltpeter. These areas were called niter beds (or nitre beds, if you're used to British spelling). Other names for these include nitraries and saltpeter plantations. We will study how these worked in today's post. Niter Beds. Click on the image to enlarge. Public domain image from a woodcut from 1598. Workers would prepare long trenches lined with clay and pile on heaps of manure, rotting leaves, plants and urine, arranged with layers of limestone and ash in between, and small twigs, branches and straws in the middle, to give the mixture sufficient porosity. Such heaps can be seen as C in the image above. The sides of the various heaps protect each other to some degree from wind and weather. Every week, the workers would keep the heaps moist by adding more urine, dung water, water from drains etc. The idea was to keep the heaps moist, but not too wet. Urine from drinkers of beer and wine were in much demand, as it was thought that this resulted in superior quality of saltpeter. The process needed to be somewhat carefully controlled because if it was overdone, the production rate of saltpeter would actually decrease. 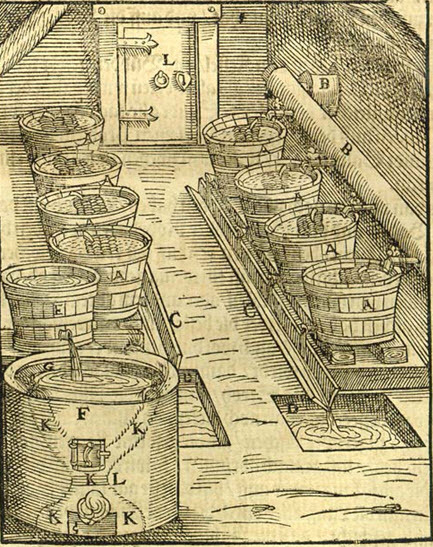 Meanwhile, the workers would collect pure rainwater in a large vat (A in the image above), as it is a relatively pure source of water without any minerals dissolved in it. They would also collect wood (D in the image) to be used to prepare ashes and for boiling the liquids later on. 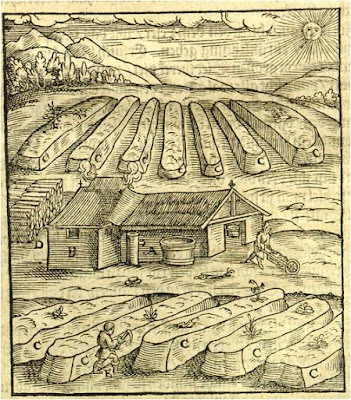 After about a year, the heaps would be ripened enough and a saltpeter digger (E in the image above) would dig into them and take them into buildings B and A for processing. Inside, they would use the pure rainwater to dissolve and leach the saltpeter crystals from the compost heap and then use the wood to boil the water and extract the crystals from it, as described in the posts previously. As can be imagined, running a nitrary (saltpeter plantation) meant that the smell was very nauseating. In fact, one of the major qualifications to be a nitrary manager or worker was to be able to tolerate the incredible stench produced. That's why many of these operations were located out in the countryside, away from most people. The remains of what once used to be the largest nitrary in Dijon, France. This was originally out in the countryside, but is now a residential neighborhood of the city. The only hint of what used to be here is the street sign. In the inset, it says "Rue de la Raffinerie" (i.e.) "Street of the [saltpeter] refinery." These nitraries were dedicated to producing saltpeter and some countries (e.g. France, Sweden, Germany, colonial-era America etc.) 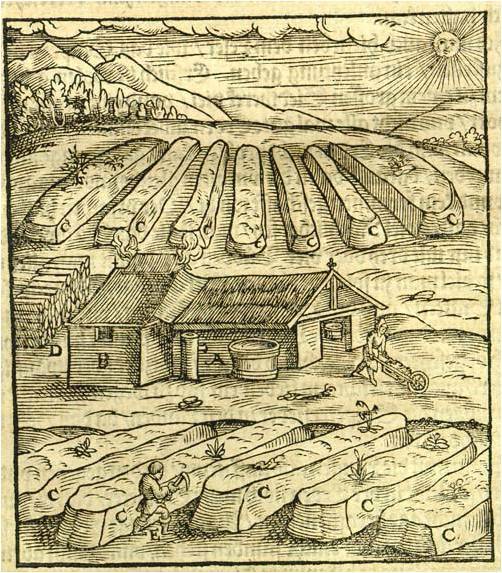 introduced laws requiring people to set aside X amount of land in each village for niter beds. A well run operation could produce, every two years, about 2-4.5 kg. (about 5 to 10 pounds) of saltpeter per cubic meter of dirt. It was a slow, painstaking, dirty and labor-intensive job, but for several countries, it was necessary for their survival. In our next post, we will look into the works of a certain Professor Joseph Leconte, who wrote a pamphlet on the production of saltpeter during the Civil war.